James was born in 1898 the son of Joseph Bosley and his wife Elizabeth née Bird. Joseph was born in Thatcham and joined the army as a young man serving for 12 years with the 19th Hussars, 8 years with the regiment and 4 years in the Reserve. Following his discharge on 18 August 1890 he evidently missed the military life, or the associated financial reward, so he re-enlisted with the local regiment as a Reservist in the 3rd Battalion, Royal Berkshire Regiment on 25 January 1893 (shaving two years off his age) attending their annual camps from 1893 to 1896, after which he was, presumably, discharged for the last time. Out of the army he worked in various jobs as a ‘stoker’ in 1891, a painter in 1893, a ‘general labourer’ in 1901 and a ‘dealer in rags and bones’ in 1911. A stoker was a man who fed a furnace with fuel usually to produce steam – perhaps in a railway locomotive, perhaps in a stationary engine (most engineering works were steam driven) , perhaps in a foundry (there were two in central Newbury) or even at the Corporation Gas Works where ‘town gas’ was produced from the heating of coal. Joseph lived a short walk from locations where all these jobs were available. The rag and bone dealing might indicate that Joseph had fallen on hard times and, unable to find decent employment was forced to exist the best way he could – or he could have found that he could make a good living in such dealing without the level of manual labour he had been forced to undertake in the past. By 1911 the Bosley’s were living at 8 Prince’s Place, an alley off the west side of Cheap Street. At that date all eight cottages in Prince’s Place and the adjoining buildings fronting Cheap Street were owned by Frederick Hopson, a member of the family that co-founded Camp Hopson, the Newbury department store. Prince’s Place was demolished when Newbury District Council built their new council offices in the 1970s (Mill Reef House). Part of the site back from the street was purchased by Newbury Baptists and now contains a church hall. This was not the habitation of a well-to-do family; its demolition could be passed off as slum clearance. The Bosleys were a large family, James (registered as Francis James) had eleven siblings: Frederick George (born 1889), Henrietta (1890), James Arthur (1891), Alice Ada (1894), Edwin David (1896), Stanley Cecil (1899), Charles Henry (1901), Francis Cecil (1904), and Margaret Maud (1906) plus two further siblings who died in infancy and cannot be identified from census returns. James was not the only one to be known by his second name as the listing from the 1911 census demonstrates: listing them as Frederick, Arthur, Ada, Edwin, James, Harry, Cecil and Maud (Henrietta and Stanley Cecil both died very young). The three eldest children were listed on the census return by mistake as all three had left home by that date – but their crossed out entries shows how they were making their starts in adult life: Frederick is listed as a soldier, but it is not known which regiment he was serving with; Arthur, aged 20, is working as a porter, a typical job for a young man in a country town; and Ada, 16, was working as a domestic servant. Edwin, still living at home, was working as an errand boy for a local hosier. James was still at school, aged 13, but was already starting in the labour market working part time as a general servant. Less than a year after they filled in their census form Elizabeth died, aged only 51, leaving Joseph to cope alone with the younger children. When war came in 1914 the family was in the unenviable position of having six sons/brothers of military age. The electoral roll in 1918 (the first to record the expanded electorate that included all males aged 21 and over) notes the absence of Edwin, James and Arthur from Prince’s Place and Frederick from an address in Craven Road. Harry and Cecil are not listed, but this does not mean they were not away in the army, neither was 21 so they would not appear in an electoral roll. At the outbreak of the war James was too young to join up; it was not until 1916 that he turned 18, by which time conscription had been introduced, so a notice to report for a medical would have arrived very soon after his birthday. 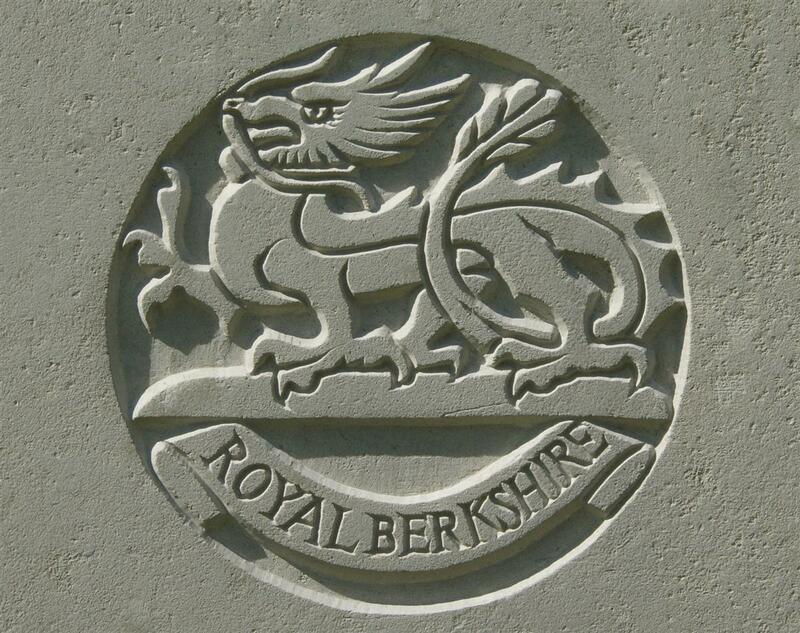 He joined the Royal Berkshire Regiment (no. 33977), seemingly being posted to the 1st Battalion. Sadly his records were among the majority of soldiers’ service records that were destroyed during WW2 so no definite information is available on his time in the army. At some point he was transferred to the Labour Corps, specifically their 89th Company. He would not have been sent to France until he was 19 in early 1917. It is possible that he went to the Front with the 1st Battalion and suffered a wound, gassing or illness that reduced his fitness level below that deemed sufficient for front line service – which would explain a move to the Labour Corps. 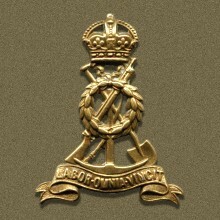 The regimental badge of the Labour Corps. Whatever the reason he was with the 89th Company, Labour Corps on 9 June 1918, working near enough to the front line to fall victim to enemy shelling. He was buried in grave III.D.1 at Hersin Communal Cemetery. BOSLEY – June 9th, killed by shell in France, Pte J Bosley, son of Mr and Mrs Bosley, Cheap-street, Newbury, aged 19 years. From his affectionate Mother and Father, Sisters and Brothers. 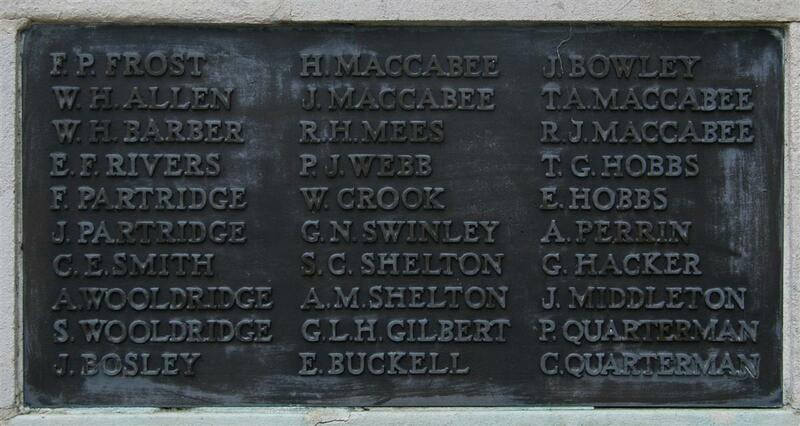 Locally he is remembered on the the town war memorial in Newbury (tablet 2). James’ brothers Frederick, Arthur and Edwin were all of an age to serve and would have been subject to conscription if they hadn’t volunteered. However, the loss of most of the WW1 service records makes research into a surviving soldier very difficult and no record has been found that can be definitely linked to Frederick or Arthur. Though it is known from the 1911 census that Frederick was serving at that time and so would, barring injury or illness, have been among those mobilised in the opening days of the war. Fortunately, Edwin’s service record is among the 25-30% of records that has survived. He served (as Edward David Bosley) having attested in December 1915 under the Derby Scheme. He was mobilised in February 1916 joining the 3rd Battalion, Royal Berkshire Regiment for training. Four months later he was transferred to the 1st Battalion, arriving in France in June. On 13 March 1918 he was gassed (a few days before the German’s launched their huge Spring Offensive) and was repatriated on 18 March to hospital in England. He returned to France on 21 September, not to the 1st Battalion, Royal Berks but to the 1st Battalion, Dorset Regiment. He remained on the Continent until March 1919 when he returned to England for demobilisation. He returned to Newbury and died there in 1959 aged 62. Thanks to Karen Newbery for her help with research into this soldier.